This giant UN75F6400 measures in at 75 inches and provides a great deal of value. Samsung has not tread ground this large for the mid tier level in the past. It's a nice acknowledgment to those who are looking for the ultimate home theater experience without dropping a very large bundle of cash in the process. The F6400 is a small step up from the F6300, but some heavy hitting features are added. Those upgrades come in the form of 3D playback and micro dimming. This is the perfect set for a value shopper looking for a good quality TV. The UN75F6400 has a matte type screen finish instead of the clear coat that I've liked so much in the past. I'm not personally a fan of the matte finish because picture quality does take a hit. They tend to reflect more in room light which tones down the brilliance of the image. This is a big difference between the F6400 and top tier models. On screen depth for 2D images isn't up to par either. The bright edge LED lighting helps to balance out the downsides of the matte screen by providing more rich colors and a good deal of contrast from the best viewing angles. All of that said, from relatively close to front and center we felt the picture displayed was very good with lots of light flow-through. The picture is remarkably similar to the ES6500 from last year. The 10pt white balance really helps to get the white balance to the right levels. Colors end up looking natural and not over saturated. The biggest problem present with the 75F6400 is side angle viewing. From the ideal viewing position, black levels and contrast are toe to toe with some of the best out there. The black letter box bars on the Days of Thunder Blu-ray are deep inky black. Other dark areas of the screen show just as strong performance without too much loss of detail. 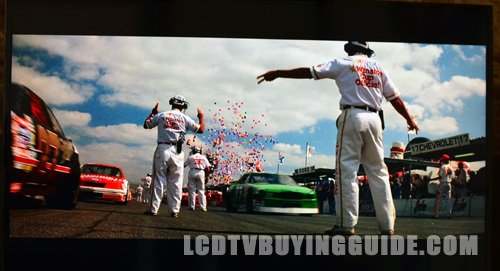 Blacks are not as stout as the best Plasma TVs, but for a mid level LED TV they are strong. Contrast has a great showing here too. Light and dark areas of the screen are separated nicely and don't bleed into each other – as long as you are not at side angles. The native 120Hz panel on the UN75F6400 is necessary for reducing motion blur for fast action, especially on a set this large. You are much more likely to notice slight imperfections in the picture on a 75 inch screen. The 120Hz upgrade is going to smooth fast action and side to side panning to create images with greater clarity. It's going to be noticed the most during sports programming that has a lot of camera movement. This also applies to shows and movies that utilize camera movement like side to side panning. The Auto Motion Plus feature is set to On by default in all of the preset picture setting modes. 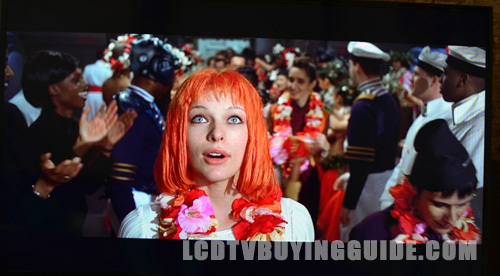 It is really only good for watching 3D content on the 75F6400 – unless you like the “Soap Opera” effect which results from eliminating too much natural background blur. For everything but 3D content, turning it off or going to the Custom setting within Auto Motion Plus and turning the Blur Reduction setting to 10 and the Judder reduction setting to 0. This is also an acceptable option. The feature creates a lot of background clarification, making images look terribly unrealistic by eliminating natural background blur and causing unnatural looking movement. Turn it off in the Picture Options menu and everything will be fine again. After turning it off, judder will be very apparent. Give your eyes some time to adjust before deciding which way is best for you to watch. When viewing 480i based content we saw slight improvements when the setting was low. Before you continue to with your 3D content, Change the picture mode to Movie and the Auto Motion to Standard. This is key to getting the best out of any 3D image. In doing so, judder is eliminated and images bright. The resulting image is sharp and clear with a good amount of depth. Colors appeared slightly subdued for 3D images, but they are certainly not bad. As usual for active 3D glasses, a small amount of flicker is present. It may be better suited for dark viewing rooms. Just like the side angle viewing for 2D content, color and contrast fade very quickly when moving from front and center. Overall the UN75F6400 gives a good performance. Turning on the Game Mode is the way to make gaming excellent on the 75F6400. The picture settings in Game Mode are different than the other picture setting presets. I think it initially looks pretty bad. Samsung even warns about a loss of picture quality. Some simple changes will remedy the situation. Standard is the only available picture mode while Game Mode is on. Take the time to turn the sharpness down to 10 or less, the Color Space to Auto, Dynamic Contrast to Off, Color Tone to Warm1, and the Screen Size to Screen Fit. Adjust the Backlight and Brightness to your personal preference. This will provide a decent picture quality as well as a cut down on input lag. This made Okami HD and Crysis for the PS3 look fantastic and the input lag was negligible at a decent 30ms. Enabling 3D once again changes the picture mode. Make similar adjustments to get the picture looking better. 3D produced a lot of judder and may not be the best way to enjoy a game. 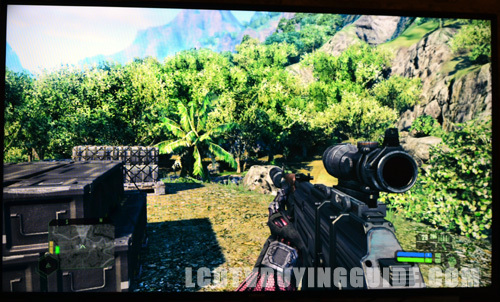 We tried out 3D with Crysis. The effects of depth look great but have a bit of cross talk to take away from the immersion. The Smart Hub platform has received a hefty redesign from the last year's version. The platform is much more intuitive and user friendly, especially for those accustomed to smartphones and tablets. I'd certainly say it is an improvement. Navigation and organization of content see the biggest upgrades while features like voice-recognition and a slew of recommendation features have been added to the mix. The UN75F6400 does not boast the quad-core processor like some of the top tier models. Instead it uses a dual-core processor to run browsing and Smart TV navigation. Last year the Smart Hub was run down with slowness and the occasional crash, but our tests didn't show any problems in that area. The plague of slow smart TV suites is coming to an end. Faster processors are the remedy to the problem of slowness for web browsing, multitasking, and navigation. This is a very nice upgrade for TVs residing in the mid tier category like the UN75F6400. The dual core processor speeds up navigation and web browsing considerably. We recall the slowness of Smart TVs in the past and are very welcoming to this speed boost. The remote for the UN75F6400 has a swipe pad that makes it easy to switch between the main Smart Hub screens. This one is black instead silver found on the top tier models. Swiping on the touch remote is definitely faster than a 5-way controller. We found it to be about 2x faster than pressing arrow buttons. It's the only remote included with the UN75F6400. Be aware that there are no numbers and not too many buttons. Samsung has included an on-screen soft remote to make up for insufficient keys. We didn't find ourselves missing some of the buttons, but having to access an on-screen menu to switch to channel 75 seems like it would be a chore. 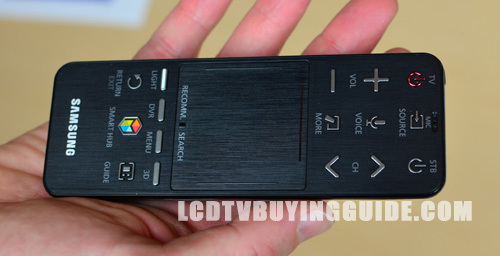 There are dedicated keys for the Mic, 3D, Smart TV, DVR, and the Menu. The remote also has a nifty back-light button. The Samsung UN75F6400 is pretty expensive at $4,000. That's just about double the price of the 65 inch model. There isn't much to compare it against when it comes to this size. Sharp is know for their large TVs and the smaller LC-70LE857U has a similar feature set for $1,000 less. The Vizio M801d has 5 inches on the F6400, and sells for the same price.